Of the two breweries, San Miguel by far dominates the country, and their pale swill is found everywhere. They produce three widely available brews, and several more I never even came across, but supposedly exist. 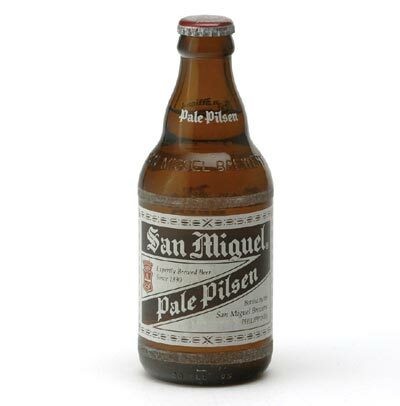 San Miguel Pale Pilsen, 5.0% ABV – The standard San Mig beer. Tastes identical to any American adjunct lager, and standard for a beer from a tropical country. Watery and nothing to write home about, but tastes good enough ice cold* when nothing else is available. 1 Hop. *Filippinos frequently drink their beer with ice in it!!! Yeah, I thought it was blasphemous as well, until I was faced with drinking warm beer (fridge space isn’t common in the rural parts of the county). When in Rome, do as the romans do. When in the Philippines, drink ice in your beer, or drink it 95 degrees. San Mig Light, 5.0% ABV – Like someone drank half a bottle of San Mig, and then filled it with water. I have to be honest, it was pretty bad, and may be able to give Natty light a run for its money. I award 0 hops, and may god have mercy on your soul. *Editors note: Um, what happens if we pan a bit to the right in that photo. And Hordeum, what exactly were you doing in the Philippines for ten weeks??? Unfortunately, I never got to try Cervesa Negra, the dark beer, or the rival breweries flagship “Beer na beer” (roughly translates in English to “Beery beer”). Now, we Joes can learn from one thing from Philippine drinking culture: Drunk food. Yeah, I know we have our pizza and fried butter, but Filippinos actually have a single vocabulary word for snacks when they drink: “Pulutan.” Well done, my friends. A large portion of my favorite dishes were served as pulutan: Kinilaw (ceviche with ginger), Sisig (sizzeling pork face with lime.. no, seriously, it’s great! ), deep fried pork, pork on a stick, deep fried fish, fish on a stick, etc. The classic Americano gross-out-food balut (boiled fertilized duck eggs) almost always is eaten when drinking, probably because its a boiled fertilized duck egg. According to the internet, even monitor lizards and extinct birds can be pulutan! So I wouldn’t go out of your way to try Philippine beer, but it certainly does the job in a pinch. Posted in Ale Factories, Beer Culture, Tasting Notes, WTF.Tagged Balut, Philippines, Red Horse, San Miguel. Oh to be knocking back some beery beer and scarfing down pork faces with “giner” right about now. Ahhh, those were the good ‘ole days…And was that partial image a picture of you and one of the “ladies” of Olongapo ?? Hmm ??? Looks like a Fields Avenue LBFM.